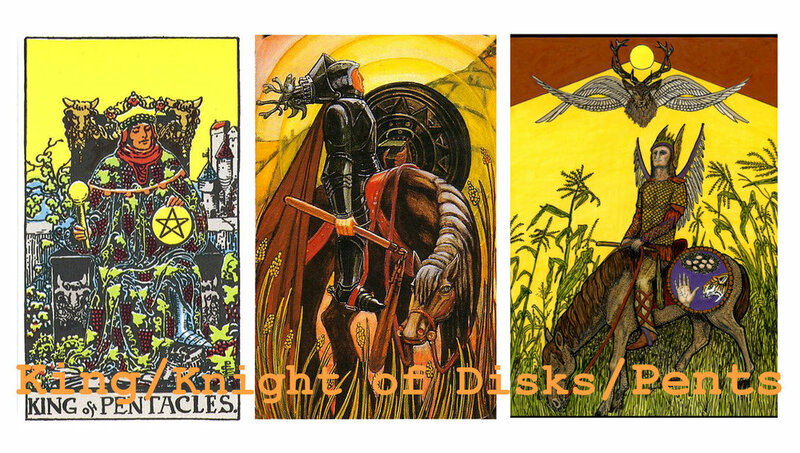 The King or Knight of Pentacles/Disks is the fiery part of earth, associated with the 7 of Wands and the 8 and 9 of his suit: valor, prudence, gain. He has left behind his leonine warrior days for the hard work of peace; he is the sacrificial harvest king who ensures plenty for his people. Efficient and material-minded, he keeps a strong and steady hand on the threshing flail, ensuring every last grain is counted or consumed. Are we here already? It is a little bittersweet to come to the end of the numbered cards, although we still have the four court cards of the Pentacles/Disks to go. I have a real weakness for the numeric minors, and this one is one of my favorites. We have arrived, at last, at the Lord of Wealth. Mercury governs the final decan of Virgo, sign of his rulership and exaltation. Therefore the 10 of Pentacles or Disks holds the culmination of our material realm: here our worldly goods reach their maximum accumulation, and our bodies come to rest. We return our legacies to the earth, a seed for the next generation. We have transmuted our corruptible flesh into alchemical gold, only to begin the cycle anew. On this week's episode of Fortune's Wheelhouse, the engines are running, the pistons are pumping, skyscrapers rise on the horizon. 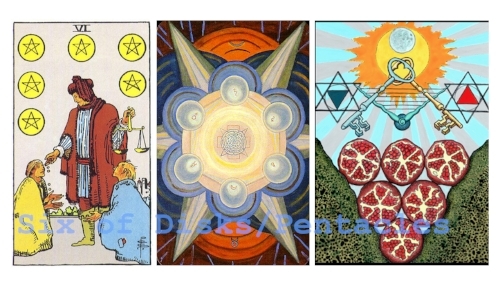 The 3 of Pentacles or Disks is the Lord of Work! and the Devil himself ensures there are no idle hands at play here. Combined with the driving force of Mars and the power of the calendrical New Year, all manner of resolutions are taking form. Here is the glory of the built world and the promise of industry writ large. Through the power of collaboration, ambition turns into 3D, concrete reality. This week on Fortune's Wheelhouse, we address the inevitable: the Lord of Change! With the 2 of Pentacles or Disks, we engage with the physical world, and the reality of trying to make our bodies, our works, our things bend to our will. First decan of the Saturn-ruled, Capricorn line-up, the 2 of Disks answers to Jupiter. The Greater Malefic and the Greater Benefic duke it out in this card, and their struggle moves mountains. This week on Fortune's Wheelhouse, the last Ace materializes on our earthly plane: silent, magical, and profound. Is it a pentacle? a disk? a coin? Even its name is a mystery! In this final suit, we finally encounter the world we know best: our round globe, the four directions, our five senses, our physical bodies and all creation. 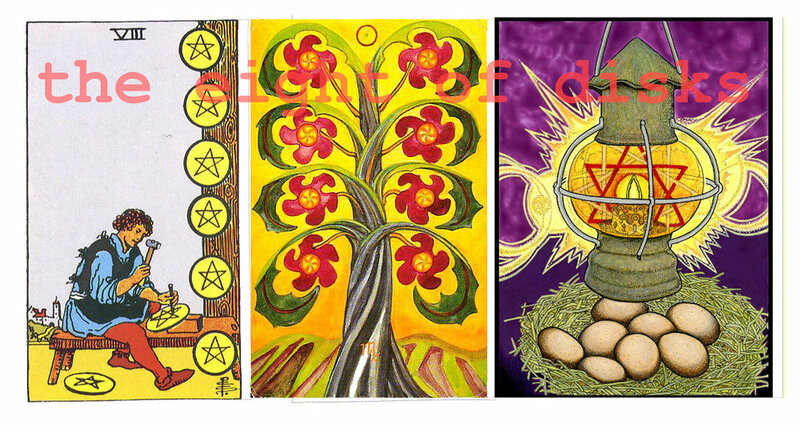 Whatever you call them - pentacles or disks, still or spinning - they are literally the whole point of the matter. This week on Fortune’s Wheelhouse, we face a steady wind: the Prince or Knight of Swords. The airy part of air, he rushes through his encounters with an unflagging force. He fights for his ideals, but also just for fighting's sake. Associated with the first two decans of Aquarius and the last of Capricorn, our Prince is a revolutionary - a master at navigating his way from defeat, and impatient with the powers that be. "I know!" he cries. Been there, done that!